Scanning of historical buildings with inaccessible areas is difficult task for archaeologists and restorers. Members of CRAS from Multi-robot Systems group (MRS) help with scanning of such inaccessible areas using their own drones. 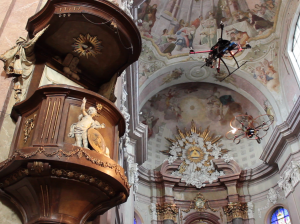 At February 26, MRS together with National Heritage Institute in Olomouc scanned the church in Sternberg. During the scanning of high placed areas such as copula and wall paintings, we used our methods for stabilization of autonomous helicopter formation. Nowadays we negotiate with other heritage institutions to scan other historical buildings. Report about scanning taken by Czech Television (only in czech language). This entry was posted in News on March 4, 2016 by Robert Pěnička. Team of Czech Technical University in Prague, University of Pennsylvania and University of Lincoln, where members of CRAS play key roles, has been selected for gaining sponsorship for participating in the Mohamed Bin Zayed International Robotics Challenge (MBZIRC) out of 143 applicants from the most prestigious universities in the world. The international team, which is led by Martin Saska, will compete with the worldwide best universities in the field of Micro Aerial Vehicles (MAV) in two Challenges. The first is to autonomously localize a moving vehicle in the arena by a single MAV and then land on a landing platform carried by the vehicle. The second Challenge is to search the arena for various static and moving color objects, then pick them and move them to dedicated area. For more information about our participation in MBZIRC see sites of Multi-Robot Systems group. This entry was posted in News on February 17, 2016 by Robert Pěnička.